Welcome To Editor Corps, Where You Can Make Your Podcast Editing Career Take Flight. Podcast editing isn’t just a fringe element of a hobby – it’s one of the fastest-growing needs on the planet. Whether you’re a podcaster, that needs to be making more podcasts rather than editing them, or a tech-savvy podcast editor, you have arrive at the central flight hub for Making Podcasts Soar! Read on below to learn more about the variety of services offered here at The Editor Corps, and look for more as we grow The Corps and provide the best in podcast editing to podcasters, producers and networks across the planet! 1 Billion, 235 Million are using it to connect, share, and communicate. I’ll be you can click the icon here and participate in The Editor Corps’ Facebook fun, can’t you? Whether it’s reminders of on-going project completion or specials, you’ll find it all there! 140 characters made it HARD to share details that matter, but now that Twitter has doubled the potential social media playing field – consider us Tweeted! Join in the Retweeting of our favorite podcast edit’d moments now via one of the most-used Search tools on the planet, now 280 characters at a time! There’s an in-depth world of knowledge online for Podcast Editors – It’s called The Podcast Editors Club on Facebook! Start your adventure there now to help find answers to burning, common questions or just to say “hello” to people with akin skill sets! 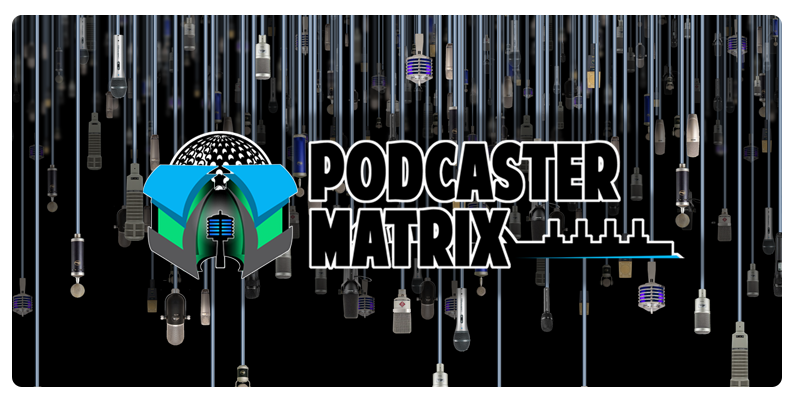 We’ve officially partnered with The Podcaster Matrix – Your Home for Hosting Your Entire Podcast Episode Library. Whether it’s learning more about the podcasting industry, getting your podcast edited, getting quality voiceover for your podcast, or promoting your program to grow your audience, you’ll get the “REAL WORLD” solution at The Podcaster Matrix. You want to have your Podcast edited? Cool. Wanna’ monetize your zeal for sitting in front of a screen modifying the digital files that make people sound great? Even better! Fill out the information below and we’ll get right back to you!